Photo by Tam Lan Truong. The McGill Percussion Ensemble was founded in 1969 by Pierre Béluse, Professor of Percussion in the Faculty of Music at McGill since 1967. The ensemble performs a wide variety of repertoire, with a strong commitment to the performance of new music. Along with its regular concerts on campus, the ensemble performs frequently in other locations and for CBC Radio’s English and French networks. In 1979, the group’s first recording titled Percussion, produced on the McGill label, won the Grand Prix du Disque-Canada for chamber music, awarded by the Canadian Music Council. This success was followed by a recording in 1980 for Radio Canada International which featured the work of Canadian composers Walter Boudreau, Vincent Dionne, and Claude Vivier. In 1988, the ensemble recorded its first compact disc with works by Edgard Varèse, alcides lanza, Jo Kondo, Francois Morel, Mantel Hood, and Pierre Béluse. In 1992, the ensemble won the Darius Milhaud Prize at the Concours d’interprétation de Musique Française de Montréal. In 1996, a second CD was recorded featuring works by Osvaldo Budon, Alberto Ginastera, and Pierre Béluse. Fabrice Marandola have been a director of the ensemble since 2006. The ensemble has an ongoing composer-in-residence program with McGill student composers. The ensemble also works with established composers in presenting new works. Recently, the ensemble has performed new pieces by Chris Paul Harman, Alcides Lanza, Philippe Leroux, Brian Cherney, James Wood, Michael Gordon and Michael Oesterle. 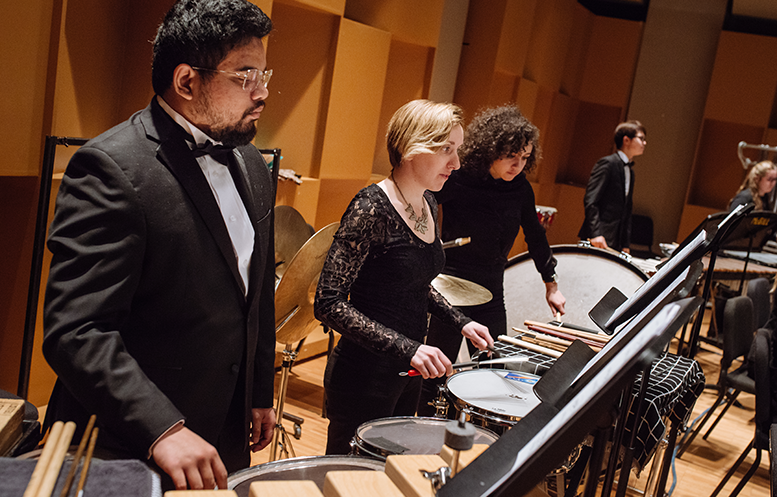 In addition to regular class concerts, McGill Percussion Ensemble performs regularly in internationally festivals including the McCormick Marimba Festival and Montreal New Music Festival in 2017.